Two days earlier we’d returned from a romantic week in a favorite city. We held hands walking in the rain-cleansed park, enjoyed restaurant meals and sight-seeing together, had laughs with friends, and had passionate nights. He was intermittently moody during the vacation, sometimes walking 20 paces ahead or behind me saying he needed some solitude. I was used to this behavior, as it happened occasionally in our 20-year marriage. It was usually a phase and if I gave him space, he worked it out. But returning home, he still seemed a bit distant. I asked if anything was wrong and he said no, so I figured he’d get over it soon enough. I fixed one of his favorite meals, and since it was Friday, we usually watched a movie. As we were finishing dinner, he asked what I’d like to do after dinner, watch a DVD? I said sure. Then there was a long pause. I’ll remember what he said next for the rest of my life. I was dumb struck. I thought surely I’d heard him wrong. “What?” I asked not believing what I thought I’d heard. “What are you talking about?” I was sure there must be some misunderstanding. We hadn’t been fighting — in fact, we never fought. We were rational, respectful people who taught others about how to communicate honestly. Our couples counselor said we could quit coming to her because we had become so good at working things out on our own. He explained that he’d gone hiking a month ago and tried to figure out why he was unhappy. He wanted to spend full time focusing on enhancing his spirituality, living alone praying and meditating. This was the first I’d heard of it. A voice came to him that our marriage was over. When I asked if his spiritual quest required him to not be married, he said yes. I asked if he wanted to spend some time alone to sort it out. He said he was sure, but we should try spending a while apart. I started crying. We talked more. Finally, after a few hours, he said he needed to go to bed. He went into our bedroom and climbed into our bed. Still crying, I too, got ready for bed. I couldn’t sleep, I was constantly weeping. Surreally, he tried to comfort me. How could someone who caused the pain think he could comfort me? But I didn’t want a new start. I wanted my old marriage back. The one with the man I thought was my soul mate. It took me a few weeks to embrace the voice’s message. I began to see that I had overlooked glaring problems in our marriage because I wanted it to work. Instead of dueling lawyers, we decided to have a mediator help us through the distribution of assets. It was like exit counseling. Without the fear of saying something that would hurt the relationship, we were brutally honest. We didn’t care if it hurt the other or not — we told our truths. When he said, “I rarely thought about you if you weren’t in the room” I realized how much time I’d spent thinking about how to make him happy, then implementing those ideas. I thought that’s what people did to have good relationships. I realized he had spent nearly no time thinking about how to make me happy. I was struck with the idea that I could have spent the rest of my life bending over backwards to make a man happy who spent nary a nanosecond thinking about how to make me happy. It was a gift to be free of him. This was the beginning of many, many epiphanies about the marriage I thought I’d been in instead of the realities of the marriage I had really been in. I began to look at what I’d compromised in the name of “having a good marriage.” I took crumbs in return. I saw all the places I’d subjugated what I wanted thinking I was being a good wife. Now was the awakening of who I truly was and what I wanted. I was no longer weighed down by someone else’s needs and fears. I started dating and learned I could be attractive to men — in fact, lots of men. I saw where my boundaries are and how to communicate them clearly. I explored activities I’d never had experienced if I was still married. So while it took me 18 months to heal my heart from the severity of the hurt, I truly do have a much better life now. If you have any lingering anger or bitterness from your divorce, see if you can reframe it as an awakening. What has awakened in your life since your divorce? 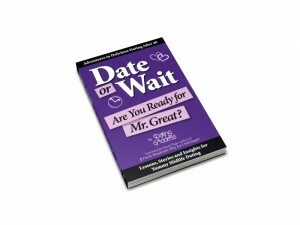 Want to better understand if you’re ready to date again? Get your copy of Date or Wait: Are You Ready for Mr. Great? hey DG..this is so heartbreaking but inspiring.i myself had a break up a few months ago and although it is nothing similar to your problem, i think i can relate..
well, that is almost identical to my story. It was almost an epiphany when I realized that I was now free to be loved and appreciated the way I was supposed to be, and no longer have to fret over what he thought or was /wasn’t doing. I now see how my own behavior exascerbated (I know the fancy words just cant spell them) the situation–I focussed totally inward on ‘us’ to the point of not pursuing my own outside interests, or friendships and serving only to push him further away emotionally. So here I am at 40, grateful to now have the opportunity open to me to have a great relationship with someone who deserves me 🙂 but also having zero experience at actually dating and no friends of my own with whom to seek support. It’ll be an interesting journey, no doubt. Sorry to ramble, just glad to see I’m not the only one who has lived this story. I spent 3 years dating my husband, then 16 years being married and I married at 37, thinking that I would be able to make a good decision at that age…………boy, did I miss out on some very key “red flags”. I had met so many men who were not marriage material that when I met my husband, he seemed normal, and appeared to be good communicator, had held a very responsible job for a long time – however, he had only been married for 3 years and his wife left him several years earlier. I should have asked more questions about why she left! Fast forward to sixteen years of marriage, and a great deal of marriage counseling for all of his issues. Not only did I marry a man who had a lot of secrets, but I married a man who now that he had “won me”, failed to communicate in any fashion, including physically. I learned rather quickly he was not the man I thought he was when we dated, but instead a completely different man who ultimately I could not stay married to. I have learned since my divorce (at the age of 51, now 55 and engaged), that I am definitely lovable, that there are good men out there who really do love women, want to communicate and build a life together, and that dating and putting yourself out there is a huge risk, but immensely worthwhile and fulfilling. I wish you well, DG, would you please tell us what reason your husband gave for departing as he did? I did share why he left: “He wanted to spend full time focusing on enhancing his spirituality, living alone praying and meditating.” Although, he went through so many reasons when we were in mediation, I realized I’d never know the real reason. And I didn’t really need to, as what was over was over, and trying to make sense of why was a futile exercise. No affair — except with God! I hacked into his email and read his journal (he still doesn’t know I did this) just to make sure. He was celibate for 2 years, then reconnected with an old girlfriend and was married within a year. When I read that your ex husband said he rarely thought of you if you were not in the room, I gasped. I gasped when I read that he sometimes refused to walk next to you in public. Whatever ups and downs the relationship had, you are way better off now. We will all never get what we want if we belittle our desires. I have never been married and for a host of reasons have yet to have a fulfilling long term relationship, but I feel at age 49 I am much better positioned to be in one should it come along. It is good to be old and wise in that regard. I feel I live an interesting and creative life and have so much to offer someone, but I am personally weary of the search, alas, but we’ll see what the fabulous 50s bring! It is so discouraging to see how being single and alone is viewed as a doomed state. Of course I get lonely at times and long for an initmate connection and wonder if it will ever happen, but until I meet someone who is right for me and puts some thought and energy into making me happy, as I would him, one is way better than two–this in reference to a dating service I saw whose motto is, “Because two is always better than one.” Really? Even when your partner never thinks of you and refuses to walk alongside you in public? Really? Good for you DG for leaving this relationship in the past. You are a smart, creative, thoughtful, talented, interesting, spirited person. Do not settle for even a hint of loserdom in men!! Yes, I shuddered when DG wrote that her husband never thought about her if she was not in the room. I can only imagine what else he said but I am still shaking my head at the “I think this marriage is over comment” and the poor timing of that comment! I mean, really? I think he owed it to DG and to sit down and talk about it like a mature human being but that is water under the bridge. I guess that his spiritual quest for being alone only lasted as long as he felt he wanted it to and then he coupled up again…….Yes, DG you deserve a much better partner than that! Thank you Brenda and Lisa for your kind words and reinforcing what I figured out 9 years ago — I do deserve better! Just to be clear — it wasn’t that he *never* walked next to me in public. In fact, 99.9% of the time we walked hand in hand, held hands in the movies, cuddled on the coach, etc. It was just once in a while he wanted to practice “walking meditation” and so I gave him space for that. I admit when he first explained he’d like this, I took it personally. Then I accepted that we had different needs and gave him the space when he shared that’s what he needed. He wasn’t/isn’t an odious man. Just one who was self-absorbed, which I’ve learned is *a lot* of people. I think if he wanted to practice “walking mediation” he could have done that alone! Even if he rarely did that, it seems extremely rude and insensitive to me. When one is in a public space, there are certain expectations for behavior. If someone suggested that to me–that he needed to walk apart from me in public, even if it happened rarely–I would be offended. It just seems so incredibly selfish. You should have told him then to take a very long walk in the opposite direction!! I know everyone has their own needs, need for space, etc. It can be hard to know when to take offense, when to see something as a red flag, when it is just a “harmless” personal difference, etc. Yes, being self-absorbed does NOT work in a marriage. My husband, when he was working which became less and less throughout our marriage, would come home from work and sit in our home office, watching sports etc which I fed, played with , and bathed our two young children. Then he would watch sports later alone, and then be on the computer alone late at night, when he purportedly could not sleep and so it went. I was alone in my marriage even on our honeymoon. Never again! Thank you for sharing. I am going through a split right now. She is telling me that she never felt “that way” about me. It was just that I was so nice and that no one had ever treated her like that or did stuff for her. After 18 years and with a 13 year old daughter . . . Oh well nothing to fight about any more. Just helping her look for a place to buy and getting on with life. I guess that I will move on but being over 50 and feeling old and . .
Wow, you deserve a big woo-hoo for making it through that. I know how hard it is. That’s the same way my 22 year marriage ended, exept he did have an affair. My five-year relationship ended the other way last summer. He made me dinner, we talked as usual, ate as usual, did up the dishes. Everything was almost too normal. Then he sat down at the table with a cup of coffee and told me he didn’t want to be in this relationship any more. It was surreal. It was like time stopped for a moment and the pain hit hard, followed by numbness. I left shortly thereafter (we didn’t live together – thank God). But the slow realization was that I was, in so many ways, overlooking, making excuses for, and keeping the peace at any cost. Ultimately, although I miss his friendship, I wasn’t getting what I needed in a relationship. I’m not sure if I had to choose; a) He left me for someone else; or b) He decided life without me is better than life with me; which is worse. Sometimes I feel like I’m just not cut out for a committed relationship with a man. I’m incredibly jealous of those couples I know that are happy and in love even after 25-30+ years of marriage. At 64, that goal is unattainable to me. Thank you for this. I don’t know. At 64, you could meet still someone and be happily married into your 90s! Do not despair. Jealous is not necessarily how I feel. More just a longing for at least one satisfying relationship at some point in my life. I know teenagers who have had more satisfying relationships than I’ve had. That’s what makes me crazy!! Maybe some people are just easier fits than others. I am a harder fit for a number of reasons so have just come to enjoy life on my own. It’s just the way it is. Too many times when I was younger, I am 49 now, I put up with never really getting what I wanted just to have some company. It is really not worth it any more. If all the good ones are taken, c’est la vie. Live an interesting and creative life and that is a fulfillment too. It is way way way better to be on your own than to be in a relationship where your deepest needs are unmet. It can be tempting to slip back into something with someone who is not right for you just to have some company. I know! But knowing how unhappy that makes a person in the long run, I have come to resist the temptation. You will never get what you want if you deny your desires. Relationship wise, my goal now is that if I am always making excuses for someone, I will excuse yourself first from the relationship!! Life and all the possibilities it holds is what awakened for me about 20 ago in my mid 30s when my then husband walked away from our little family of me and 2 children. After getting over the shock, I decided I was going to have a second chance at life. Although I never remarried I have had a fabulous ride, met fascinating people, traveled to places I only dreamed of. There have been ups and downs, of course. I decided that everytime something ends, it is a new beginning, a new chance for something new to come into my life — whether I actively seek it or it just appears. That seems to have worked for me so far. Thanks for sharing your story. I don’t think I’d ever read the end story of your marriage. Your ex sounded incapable of loving someone else. The selfishness is astounding even after all I’ve been through with dating & hearing other people’s stories. Thankfully, I never married any of my selfish men. My sister, however married a couple. Another former friend of mine has married & divorced 5-6 times. I tend to believe in “her” situation, it wasn’t always the guy’s fault. But, what you share about your awakening is kind of how I look at my disastrous relationships that did not end in marriage. Sometimes, being married is not all it’s cracked up to be, especially when you own assets together. Sometimes I relish the fact that I’m single and don’t have anyone to date in my life. It’s saved me a lot of grief in the last few years when I needed to focus on other issues in my life. To sound like an armchair psychoanalyst, it sounds like your ex would not be good marriage material for anyone. He wasn’t “happy” with you but would he have been happy with anyone else for any length of time? Sounds like he had some growing up to do as well. We can also learn a lot from the now deceased actress, Liz Taylor. Taylor who had been married MANY times liked the high of dating, getting a ring, getting married over & over again. What she didn’t like was the everyday humdrum life of being married to the same person for any length of time. I read an article about her many years ago which talked about what was her real issue and that was always wanting that high with being newly married & not liking the lows and just average days that most married couples experience throughout their lifetime. Marriage requires commitment, maturity and an unselfish spirit that fewer & fewer people seem to be able to obtain. Maybe that is why our divorce rate is so high in this country. Be thankful, at least, that you didn’t stay with him any longer than you did. He did give you the gift of freedom, but his karma will catch up with him – if it hasn’t already. Thanks for posting this. gee i don’t know whether to be a/ releived to not be the only one with this story, b/ horrified at how many actually DO share my story, or c/ impressed with the positivity that appears in so many of them regarding a bright new future. Wow, did I ever need this post! Thank you. I’ve been dragging around my bitterness for ten years after my ex distroyed my life. Thank you for reminding me to reframe it as an awakening. It won’t be easy, but at least I have another perspective. Next post: Would you move to find love?